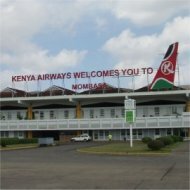 This page explains the basics about flights to Mombasa. Though Mombasa does have it’s own small international airport, the big majority of international flights come in through Nairobi’s bigger airport. It’s especially a much smaller number of chartered flights (part of vacation packages) that go directly to Mombasa. So unless you can find a suitable vacation package that goes directly to Mombasa, you’ll have to change planes in Nairobi. My favorite search engines for finding the lowest air fares to Kenya are Kayak and Vayama. Kayak.com searches over 140 flight sites for the lowest fares to your destination, meaning you don't have to visit all these sites yourself. Vayama.com essentially does the same, but with different sites, and is especially good if you travel to or from North America or Europe. If you have to get a connecting flight from Nairobi to Mombasa, you should check both Kenya Airways (the international Kenyan airline) and the many smaller domestic airlines that Kenya has. Africa Point, a good quality Nairobi travel agent, has the biggest overview of flights to and from Mombasa. The information below is limited to scheduled flights. For charters (part of vacation packages), contact your local travel agency. From North America: You’ll even have to change flights twice to get to Mombasa, since there aren’t any direct flights from North America to Kenya (Nairobi) in the first place. Northwest Airlines is affiliated to Dutch KLM and Kenya Airways, and it has good connections to Kenya (including Mombasa) via Amsterdam or London. Alternatives are Virgin Atlantic, British Airways or KLM. From Europe: Dutch KLM has a joint venture with Kenya Airways and has good connections and rates from Amsterdam. Other airlines include Brussels Airlines (Belgium) and Swiss International Airlines, from Zurich. Round trips start from 600-800 Euro, depending on the time of the year. From Australia and New Zealand: the situation is the same as with North America: there are no direct flights to Nairobi. You’ll have to change planes in southern Africa, Asia or the Middle East. If you cannot find a direct flight to Mombasa from there, you’ll again have to change planes in Nairobi. From Asia: Kenya Airways maintains connections with Dubai, Hong Kong, Bangkok, Guangzhou and Dubai several times per week, but these flights are to Nairobi, so again you’ll have to change planes there for Nairobi. More information about international connections is on my Flights To Nairobi page. If you are already within Kenya or East Africa, then arranging a flight to Mombasa is pretty easy. Many small and local airlines come into Moi from all over the continent. Check Africa Point for the availability of flights to Mombasa from other parts of Kenya. There are two international airports in Kenya, Jomo Kenyatta International airport in Nairobi and Moi International airport in Mombasa. The largest of the two is definitely Jomo Kenyatta, which offers the greater number of airline choices and also has better flight services. Depending on where you are flying from, you may pass through either or both of them during your trip. There is a smaller airport in Nairobi, Wilson airport, that caters to more local air traffic. When flying into Nairobi from within Kenya or it’s neighbors, you might find yourself there instead. They all have good modern services, with shuttle services to and from the cities. Furthermore, some of the popular tourist destinations in Kenya (such as Masai Mara, Amboseli and Lamu) also have airstrips where small domestic airplanes can land. See my page about airports in Kenya.